The Vision Development Kit is a complete hardware and software framework designed to accelerate the development of vision applications. The framework offers both a Xilinx Spartan 6 FPGA and a TI OMAP-L138 dual core processor, and is based on Critical Link’s production-ready MityDSP-L138F System on Module (SoM). 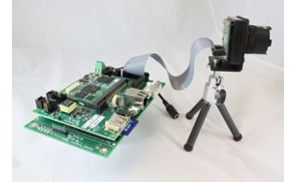 The hardware contained within the kit includes a MityDSP-L138F module, one of five compatible cameras, and a base board that features a strong array of interfaces found on the ProfiBus Development kit as well as a camera interface expansion board. A Software Development Kit is included that provides examples on adding your own custom DSP or FPGA vision algorithms and the development environment to do so.